Well here it is. 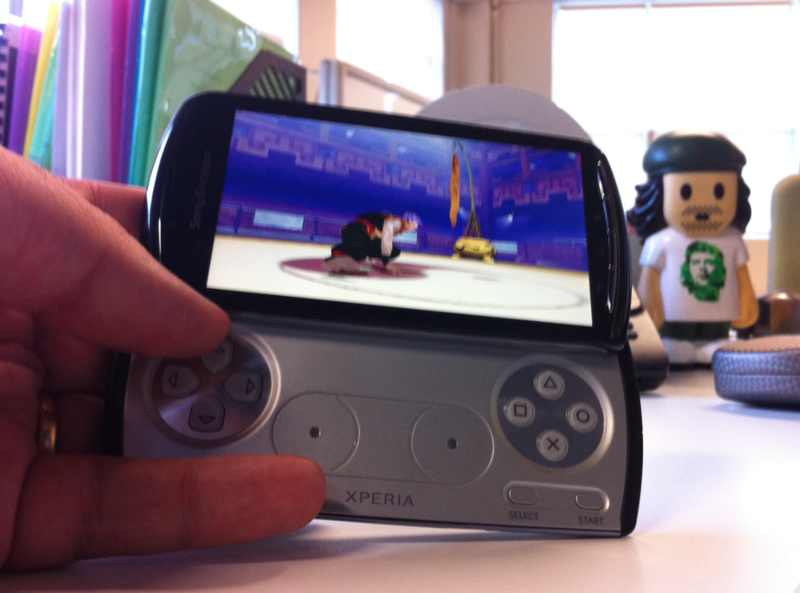 The Xperia PLAY, aka the PlayStation Phone will officially go on sale in June. The good news? It will be available on the Vodafone and Telecom networks. The bad news? Well maybe it’s not bad news, but the price (set by the carriers) of $1099 might stretch the wallet. Sony Ericsson has announced the game changing XperiaTM PLAY, the latest phone in its XperiaTM range of Android based smartphones. XperiaTM PLAY delivers the smartphone experience that users need, teamed with the immersive gaming experience that any gamer would want. In portrait mode, the Android smartphone offers all the benefits that users have come to expect from Sony Ericsson’s existing range of XperiaTM smartphones—superior entertainment and social networking features, a high-quality 5 megapixel camera and a vibrant 4” multi-touch screen. However, slide out the gaming control and users enter a revived world of mobile gaming. The slide out game pad reveals a digital D pad, two analogue touch pads, two shoulder buttons and the four PlayStation icons: circle, cross, square and triangle. Qualcomm’s optimized Snapdragon processor with a 1Ghz CPU and embedded Adreno GPU graphics processor deliver smooth 60fps play-back 3D mobile gaming and Web browsing with minimal power consumption, so Xperia™ PLAY users can enjoy long hours of battery life and game time. Sony Ericsson has partnered with key publishers in the gaming industry to deliver a rich, vibrant ecosystem at launch and post launch with many leading new titles available via the AndroidTM Marketplace. Leading franchises coming to Xperia™ PLAY includes EA’s Need For Speed, Sims 3 and a world-first multiplayer version of FIFA 10 for mobile. GLU Mobile/Activision will be bringing Guitar Hero while Gameloft’s titles include Assassin’s Creed and Splinter Cell. Sony Ericsson is also partnering with Unity Technologies, using its award-winning development platform, to ensure a continuous flow of high quality 3D game titles. A pre-loaded application will enable users to easily discover and download titles that have been optimised for game play on Xperia™ PLAY, access recently played games and see information about the games they have downloaded.